Many philosophers believe they can gain knowledge about the world from the comfort of their armchairs, simply by reflecting on the nature of things. But how can the mind arrive at substantive knowledge of the world without seeking its input? Michael Strevens proposes an original defense of the armchair pursuit of philosophical knowledge, focusing on "the method of cases," in which judgments about category membership--Does this count as causation? Does that count as the right action to take?--are used to test philosophical hypotheses about such matters as causality, moral responsibility, and beauty. Strevens argues that the method of cases is capable of producing reliable, substantial knowledge. His strategy is to compare concepts of philosophical things to concepts of natural kinds, such as water. Philosophical concepts, like natural kind concepts, do not contain the answers to philosophers' questions; armchair philosophy therefore cannot be conceptual analysis. But just as natural kind concepts provide a viable starting point for exploring the nature of the material world, so philosophical concepts are capable of launching and sustaining fruitful inquiry into philosophical matters, using the method of cases. Agonizing about unusual "edge cases," Strevens shows, can play a leading role in such discoveries. 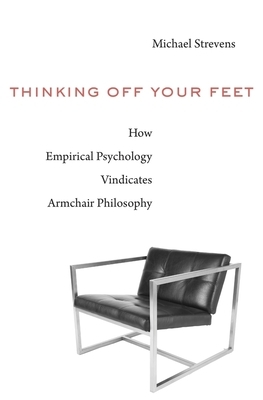 Thinking Off Your Feet seeks to reshape current debates about the nature of philosophical thinking and the methodological implications of experimental philosophy, to make significant contributions to the cognitive science of concepts, and to restore philosophy to its traditional position as an essential part of the human quest for knowledge.